Harry A. Sheppard, 85, an Air Force Colonel and World War II fighter pilot who served with the Tuskegee Airmen and retired in 1974 as liaison to the Federal Aviation Administration, died of cancer July 22, 2003, at his Arlington, Virginia, home. Colonel Sheppard was a native of New York who studied electrical engineering at the City College of New York for three years before enlisting in the Army Air Corps in 1941. Trained initially as an aircraft and engine mechanic, he completed flight training at Tuskegee Army Airfield in Alabama. He and other members of the 332 Fighter Group were the military's first black pilots. He flew more than 100 missions over North Africa and Europe before becoming a B-25 bomber instructor. His honors included the Distinguished Service Medal, Legion of Merit, Distinguished Flying Cross and 14 awards of the Air Medal. Later in life, he lectured frequently about the history of the Tuskegee Airmen and was interviewed for programs and documentaries, including "Nightfighters," released in 1994. He spoke on behalf of the Tuskegee Airmen's Association at schools and corporations across the country to raise scholarship money for young people aspiring to careers in aerospace and aviation. Colonel Sheppard later had air traffic control and communications assignments. He directed flight facilities at bases in Alaska, where he attended the University of Alaska, and Oklahoma, where he attended the University Oklahoma. After he retired, he was a manager and consultant for Evaluation Technologies Inc. He volunteered as a director of the Arlington-Alexandria Coalition for the Homeless and at the Arlington Community Center. Survivors include his wife of 60 years, Amy Sheppard of Arlington; four daughters, Gail Lawson of Seattle, Linda Smaldore of Springfield, Arlyn Marshall of Herndon and Joanne Handy of Media, Pennsylvania; and six grandchildren. 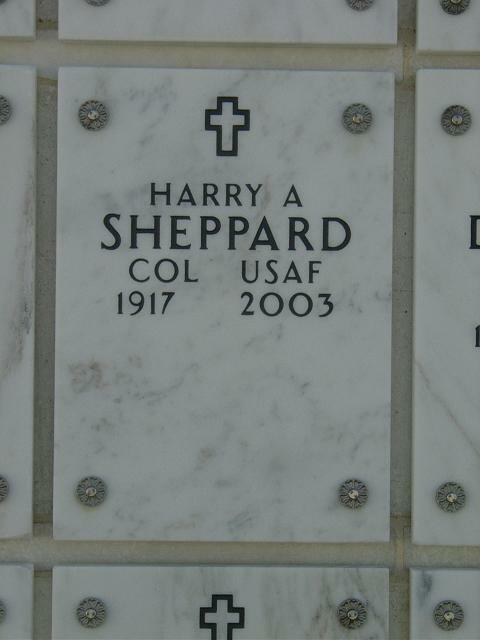 On Tuesday, July 22, 2003, Col. HARRY A. SHEPPARD, USAF, (Ret.) at his home in Arlington, VA. Survived by Amy Sheppard, his loving wife of 60 years; four daughters and their husbands and six grandchildren. A Memorial Service will be held on Tuesday, September 9 at 11 a.m., Fort Myer Old Post Chapel. Inurnment immediately following at Arlington National Cemetery Columbarium. In lieu of flowers, memorial contributions may be made in his name to the Hospice of Northern Virginia, 6565 Arlington Blvd., Suite 501, Falls Church, VA 22042.